THE SKINNY: A lot of night creams seem heavy or cause me to wake up with an oily sheen. 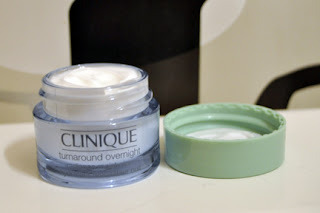 Clinique’s Turnaround Overnight Radiance Moisturizer doesn’t. After a few weeks of use (a little bit goes a long way, luckily), my skin did look healthier and feel smoother. According to Clinique, this moisturizer helps shed dull, worn-out surface cells. It feels good on my skin, too. It’s creamy, lightweight and a little bit cool. It’s luxurious, just like you would expect it to be. This moisturizer didn’t irritate my skin or my eyes. It doesn’t have any real scent, which is nice. CHECK IT OUT: You can always find a deal or extra samples at the Clinique site.